Riding a bicycle is more than basic transportation—it can be a fun and exciting hobby. When you ride you're not alone. You share the road with cars, trucks, pedestrians, and other cyclists. Since accidents can turn a bicycling adventure into a bicycling tragedy, here are some tips to help make your ride a safe one. Protect your head. Wear a helmet. Studies have shown that using a bicycle helmet can reduce head injuries by up to 85%. Select a helmet that has a snug but comfortable fit. Look for the helmet labels that show they are recommended by either the American National Standards Institute (ANSI) or the Snell Memorial Foundation. See and Be Seen. Wear proper clothes. Wear clothes that make you more visible. Clothing should be light in color and close fitting to avoid being caught in the bicycle's moving parts. Also, be sure that books and other loose items are secured to the bike or are carried in a back pack. Go With the Flow of Traffic. The safe way is the right way. You must obey the rules of the road. These include all traffic signs, signals, and road markings. Ride on the right side of the street in single file. Use proper hand signals. Never weave from lane to lane or tailgate to hitch rides on moving cars or trucks. Look Both Ways. Be aware of traffic around you. Seven out of ten car-bicycle crashes occur at driveways or other intersections. Before you enter a street or intersection, check for traffic and always look left-right-left. Walk your bicycle across busy streets at corners or crosswalks. Stay Alert. Keep a look-out for obstacles in your path. Watch out for potholes, sewer gratings, cracks, railroad tracks, loose gravel, and broken glass. Before going around any object, look ahead and behind you for a free gap in traffic. Plan your move, and then signal your intentions. Be especially careful in wet weather, as water can make you slip and make your brakes work improperly. Beware the Dark Side. Be cautious when biking at night. If you have to ride at night, display front and rear reflectors on you bicycle. 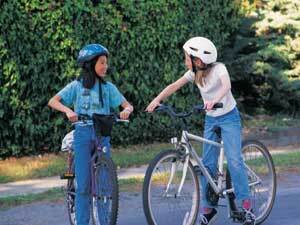 Wear reflective clothing or materials, especially on your ankles, wrists, back, and helmet. Ride in areas that are familiar and on streets that are brightly lighted. Go Off-Road. Follow designated bike routes if available. Bicycle routes are marked by special signs or lines. Bike paths are special areas reserved for bikes. Become familiar with such accommodations for cyclists in your area. Fix It Up. Make sure your bicycle is adjusted properly. Your bicycle should be correctly adjusted to fit you; your feet should rest on the ground while sitting in the seat. Before using your bike, check to make sure that all parts are secure and working. The handlebars should be firmly in place and turn easily; the wheels should be straight and secure. Stop It. Check brakes before riding. Control your speed by using your brakes. If your bicycle has hand brakes, apply the rear brakes slightly before the front brake. Remember to ride slowly in wet, slippery weather and to apply brakes earlier since it takes more distance to stop. Don't Flip Your Bike. Wheels should be securely fastened. Check wheels before every ride, after every fall, or after transporting your bicycle to be sure that they are fastened and secure. Make sure that tires are properly inflated. Always Lock Your Bicycle Securely. Whether you are gone for a few minutes or a few hours, always secure your bicycle. Use a U-lock, securing both wheels and the frame to a stationary object such as a post, fence, tree, or bike rack. For extra security, add a chain or cable with a good padlock. Record The Serial Number Of Your Bicycle. Keep a copy of the sales receipt and take a picture of your bicycle. Keep those items together. Mark Your Bicycle With An Engraver. This will help to deter thieves and to help the police in identifying and returning a stolen bike to the rightful owner. Engrave with a California Driver's License Number or California ID Card Number. For more information on bike safety, contact the Traffic Office at 760-839-4707.